This article by Randal C. Archibold appeared in The New York Times. PHILIPPE DODARD, often called the Picasso of Haiti, was searching for vibrations. This could sound ominous in a country widely devastated by an earthquake more than four years ago. Mr. Dodard says he was lucky to have survived that day. He had left a meeting at the National Palace shortly before it was destroyed, and then his car nearly ran off the road as the ground beneath it shuddered and swayed. But in his studio here high on a hillside above the throng of the capital below, Mr. Dodard, 59, was speaking in metaphors, the vibration coming not from the earth but the “silent drumbeat communicating the energy of life.” His African ancestors used the drum, but his instrument is the paintbrush. A few weeks later, that work would go on display at one of South Florida’s most renowned museums, adding to the acclaim of an artist whose works sell for thousands of dollars and have been exhibited in Paris, New York and Los Angeles and who counts the designer Donna Karan and the filmmaker Jonathan Demme among his fans. 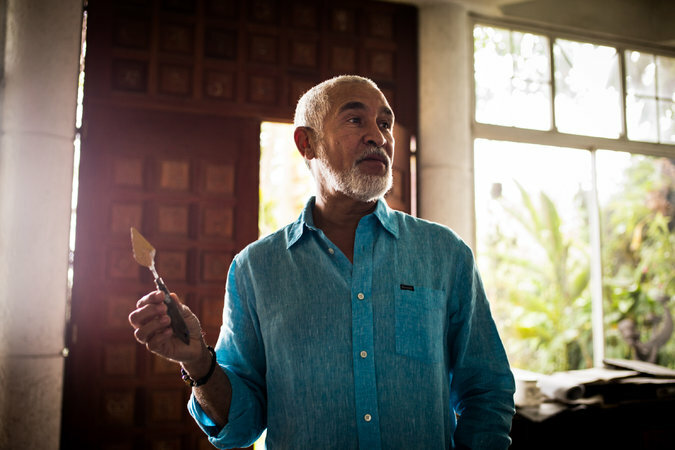 His works — not just paintings, but iron sculptures, jewelry and photography — tap into Haiti’s rich tradition of art. There is a yearning for expression born from the country’s natural beauty and the hardships of slavery, disasters and years of political turmoil. His style, befitting a country of racial and cultural mixing, blends influences including African masks, the Haitian Voodoo, or Vodou, religion and European masters. Now, Mr. Dodard is working on one of his most challenging pieces, seeking to spread that influence as director of Haiti’s only public arts school, known by its French acronym, Enarts. In a warren of dingy classrooms and studios in a rough downtown neighborhood, the school had fallen into neglect in recent years, a situation made worse by the January 2010 quake. HE pulled discarded statues from the broken-down foundry and brought in more professionals to teach. He is planning a fund-raising campaign, hoping to tap into the growing circle of internationally known figures he has befriended. He said he accepted the appointment to the school, by President Michel Martelly, a friend, out of a sense of duty and wanting to give back after the earthquake. Many artists were killed in the disaster, and their works were damaged or destroyed. Mr. Dodard was spared the worst, but he said he did have two close calls. To heal emotionally, he painted a vivid, black-and-white work that reflected chaos and was inspired by the cries in the dark night. He also taught art to children in camps for people who lost their homes, using school buses donated by the Dominican Republic as classrooms. But he yearned for more. Ms. Karan, who unveiled a spring fashion line in 2012 with designs inspired by Mr. Dodard, suggested he make teaching a priority. When Mr. Martelly asked if Mr. Dodard would lead the school, he seized the chance. But rebuilding the school has presented challenges. There have been four culture ministers since he started, and he is never certain of the budget. But he said the students, 300 or so, move him. They are, with a few exceptions, the sons and daughters of street vendors, craftsmen and women, and the unemployed who struggle to afford the $100 annual tuition. One aspiring sculptor, Woklo Caymitte Woodly, worked all year on a bust of his mother. He gave it to her in thanks for sending him to the school. “How could you not be moved by that?” Mr. Dodard said. Mr. Dodard’s own mother was pivotal to his formation as an artist. His father was an accountant, and his mother was a secretary and artist herself, who along with a godmother who was a drawing teacher encouraged Mr. Dodard, one of eight children, to pursue his curiosity. He recalled his first piece, done at age 5. HE got most of his professional training in the early 1970s at the Poto-Mitan School of Art under masters such as Patrick Vilaire and the artist known as Tiga, who had traveled to Africa and returned with a determination to spread that continent’s arts and culture. He lists Picasso among his influences, and notes that he and Picasso looked to African masks for inspiration. The difference is that Mr. Dodard, with African ancestry, claims a closer connection and has paid homage to it in works such as “In Memoriam,” an abstract metal sculpture honoring the sacrifice of slaves in Haiti. As Mr. Dodard gained international prominence, political cartoons he had drawn came to the attention of Mr. Demme, who said he fell in love with Haiti’s art while on a trip there in the mid-1980s and was particularly moved by the “visual literature” of Mr. Dodard’s paintings. He featured Mr. Dodard in two documentaries, “Haiti Dreams of Democracy” and the “The Agronomist,” giving the artist wider exposure. “As the years went by, the cartoons featured in the documentary became more visionary and a heartbreaking prediction of the difficult road to democracy,” Mr. Demme said. If Mr. Dodard regrets anything, it is that his jammed schedule of school commitments, exhibitions and fund-raising has cut into his studio time. His studio is an eerily quiet place in a rambling house, where he seeks out the rhythm of the piece, and of life itself. He practices yoga and reiki, a Japanese relaxation technique, and can sound like an instructor as he explains himself.